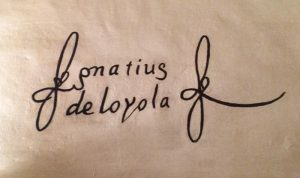 Our Mission: to inform, form and transform adult members of the McQuaid Jesuit Community through the vision and legacy of St. Ignatius of Loyola. Íñigo López de Loyola was born in Azpeitia, Basque Spain on October 23, 1491, the thirteenth child of Beltrán Yañez de Loyola, a descendant of a noble and ancient family and Marina Sánchez de Licona, herself of noble and ancient heritage. Soon after Inigo’s birth she died and the child was sent to live with Maria de Garin, the young wife of the local blacksmith. At seven years of age he returned to Loyola castle where he lived until his father died in 1507 when Inigo was sixteen years old. Shortly after, he was sent to Arévalo to join the household of Juan Velázquez de Cuéllar, majordomo of Queen Isabella and treasurer general of Castile. For the next ten years young Iñigo was exposed to life at court. He was groomed to be a knight in the service to the Crown. Iñigo was drawn into the literature of Spanish Renaissance, with its tales of amorous intrigue and ideals of chivalry and courtly love. With Valázquez’s death, Iñigo’s world fell apart. Valázquez’s widow provided him with five hundred escudos and two horses, and advised him to seek out the Duke of Nájera. Thus Iñigo’s military career began and ended when at the Battle of Pamplona, his knee, ego and dreams of a great military career were shattered. Iñigo was twenty-six years of age. The French returned the fallen soldier to Loyola Castle and there God began the great work of conversion in his heart, mind and soul. Thus the beginning of his spiritual formation that lead him to the Abbey of Montserrat and beyond. Dedicated to the care of souls, Iñigo shared the wisdom of his experience with those who hungered for a deeper relationship with God. Three times the Spanish Inquisition examined his spiritual orthodoxy and found no error. Counseled to acquire a theological education, Iñigo attended the Universities of Barcelona, Alcalá and Salamanca, finally completing a theological degree from the University of Paris. Here Master Ignatius of Loyola attracted Francis Xavier and Peter Favre, men of noble character and generous spirit. Together they began the Compañeros de Jesús, or the Society of Jesus. After lengthy and careful discernment the new band of brothers finally agreed on May 3, 1539 that they would take a vow of obedience to the Pope, place themselves under a religious superior and travel anywhere in the world the Pope sent them. Their mission would be to teach the Commandments and Christian doctrine, and that they should have a special mission to teach catechism to children, and that each man’s work should be left to the superior. This constituted the essence of the “Formula of the Institute,” the foundation of the Constitutions of the Society of Jesus. Ignatius served as Superior General from April 9, 1541 until his death on July 31, 1556. In those fifteen years Ignatius the General governed the Society from Rome where he wrote the Constitutions, directed the Society and most importantly to McQuaid Jesuit, the Ratio Studiorum, Ignatius’ Official Plan for Jesuit Education which inspires and governs the unique essence and style of Jesuit education. The work of the Society grew by leaps and bounds, establishing missionary beachheads and colleges in all parts of the globe, dealing with the papal court, kings, bishops and nobility of all ranks, and with Christians from all walks of life. While absorbed in the demands and details of governance, Ignatius never lost touch with his reason for living, his life with God. For almost twenty-five years Ignatius wrote, edited and revised the Spiritual Exercises, his great spiritual legacy to the Church. The Spiritual Exercises are the bedrock for forming an Ignatian Identity for our Mission of Educational Excellence for the adult community at McQuaid Jesuit. Following in the footsteps of Ignatius we seek transformation of mind, heart and soul to reflect more completely the glory of God in our identity and mission. Francis Xavier was born in Navarre, Spain on 7 April 1506. He was the son of Juan de Jasso y Atondo who acquired a doctorate in law at the University of Bologna, and later became privy counsellor and finance minister to King John III of Navarre. Francis’ mother was Doña María de Azpilcueta y Aznárez, sole heiress of two noble Navarrese families. Francis studied in Paris at the Collège Sainte-Barbe, University of Paris, where he would spend the next eleven years. In 1529 Francis lived with Pierre Favre (both 23 years old) and Ignatius of Loyola (38 years old). Pierre, religious by nature easily gravitated to Ignatius, but not Xavier. Francis was a man addicted to gambling, and who had dreams of advancement, honor and glory. Xavier, however was converted. He found out Ignatius begged for money to pay Xavier’s gambling debt. Stunned by such great affection and generosity, Xavier asked himself, “what sort of man would do this?” Ignatius directed Francis Xavier through the Spiritual Exercises. During this retreat Xavier discerned the call to join Ignatius and a small band of brothers who desired to give themselves in the service of Christ the King. On 15 August 1534, in the crept of the Church of Saint Denis in Montmartre outside Paris, Francis, Ignatius of Loyola, Alfonso Salmeron, Diego Laínez, Nicolás Bobadilla, Peter Faber, and Simão Rodrigues made private vows of poverty and chastity. and to go to the Holy Land to convert infidels. Francis began Theological studies in 1534 and was ordained on June 24. 1537. After teaching Aristotelian philosophy at Beauvais College, University of Paris, Francis Xavier began his missionary career. On 7 April, 1541, he sailed for India landing in Goa on May, 16, 1542. The first five months he spent in preaching and ministering to the sick in the hospitals. He would go through the streets ringing a little bell and inviting the children to catechism. About October, 1542, he started for the pearl fisheries of the extreme southern coast of the peninsula, desirous of restoring Christianity which, although introduced years before, had almost disappeared on account of the lack of priests. He devoted almost three years to the work of preaching to the people of Western India, converting many, and reaching in his journeys even the Island of Ceylon. In the spring of 1545 Xavier went to Malacca. the following year he went to Molucca Islands, where the Portuguese had some settlements. For the next year and a half he preached the Gospel to the inhabitants of Amboyna, Ternate, Baranura, and other islands. By July, 1547, he returned to Malacca where he met a Japanese person named Anger (Han-Sir), from whom he obtained much information about Japan. His zeal was at once aroused by the idea of introducing Christianity into Japan, but for the time being the affairs of the Society demanded his presence at Goa. Xavier went taking Anger with him. During the six years that Xavier had been working among the infidels, other Jesuit missionaries had arrived at Goa, sent from Europe by St. Ignatius; moreover some who had been born in the country had been received into the Society. In 1548 Xavier sent these missionaries to the principal centres of India, where he had established missions, so that the work might be preserved and continued. He also established a novitiate and house of studies, and having received into the Society Father Cosme de Torres, a spanish priest whom he had met in the Moluccas, he started with him and Brother Juan Fernández for Japan towards the end of June, 1549. The Japanese Anger, who had been baptized at Goa and given the name of Pablo de Santa Fe, accompanied them. They landed at the city of Kagoshima in Japan on August 15, 1549. That entire first year was devoted to learning the Japanese language and translating into Japanese, with the help of Pablo de Santa Fe, the principal articles of faith and short treatises which were to be employed in preaching and catechizing. When he was able to express himself, Xavier began preaching and made some converts, but these aroused the ill will of the bonzes, who had him banished from the city. On the road again, he reached Meaco, then the principal city of Japan, but he was unable to make any headway. He retraced his steps to the centre of Japan, and during 1551 preached in some important cities, forming the nucleus of several Christian communities, which in time increased with extraordinary rapidity. After working about two years and a half in Japan he left this mission in charge of Father Cosme de Torres and Brother Juan Fernández, and returned to Goa, arriving there at the beginning of 1552. Here domestic troubles awaited him. Certain disagreements between the superior who had been left in charge of the missions and the rector of the college had to be adjusted. Once settled, Xavier set his heart toward China. In April, 1552, he left Goa but never made mainland China. After a brief illness Francis Xavier breathed his last and died on December 3, 1552. 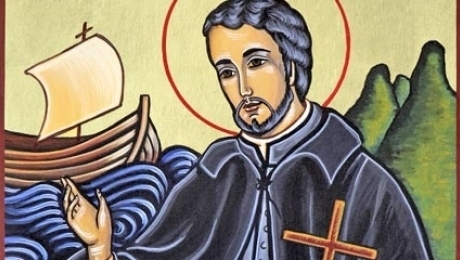 In the space of ten years Francis Xavier blazed an expansive and impressive missionary trail. On geographic frontiers he preached the Gospel with words and his example, he worked in hospitals and buried the dead, and he taught catechism to children and brought Christianity to new lands. Because of his single-hearted love for God, the study of Theology and the mission of the Society of Jesus; because of his humility and openness to conversion and growth; because of his great love and respect for persons of other cultures, lands and languages; and because of his courage, imagination and selflessness, McQuaid Jesuit honors St. Francis Xavier, SJ as the Jesuit model our young men aspire to emulate.